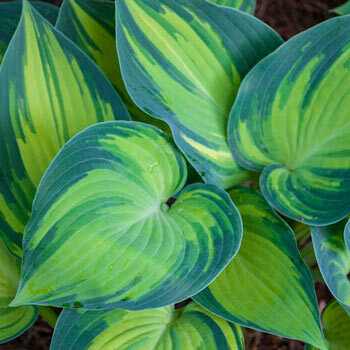 The heart-shaped leaves on this cool-toned hosta are the sweetest way to cover the drying foliage of spring-blooming bulbs. The nice, heavily grooved texture dissuades slugs, which is a big deal because slugs ususally adore hostas. 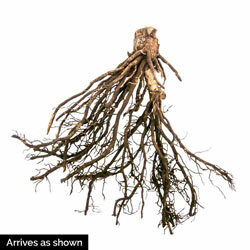 June Hosta is easy to grow in a lot of tough environments, including polluted city gardens and bare, shady spots. However, a little extra sunlight in summer paints the stroke of color down the center of these leaves in light golden hues. Great for containers and for borders. In July to August, scapes of pale blue blooms rise up over the foliage, attracting pollinators. Foliage Type: Pointed, ovate, wide, streaked leaves with blue-green coloring and chartreuse centers. During the summer, the leaf center becomes light gold when exposed to enough sunlight.